In an 1895 letter to a friend, when the safety bike was in fashion, H.G. 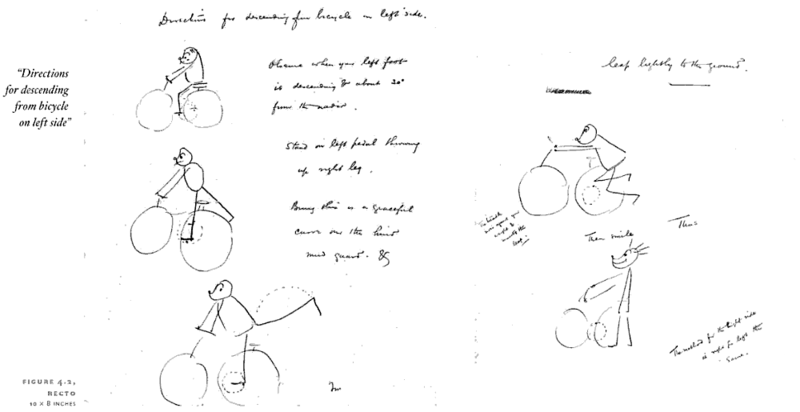 Wells demonstrated how to dismount a bicycle with instructions and an illustration. Observe when your left foot is descending & about 30° from the nadir. Stand on left pedal throwing up right leg. Bring this in a graceful curve over the hind mud guard & leap lightly to the ground. The treadle moves against your weight & assists the leap. Then smile. Thus. 117 years later, on bikes made of space-age materials, that’s what we’re doing in Cross before a barrier or run up. For the remounting technique, see this instructional video we made a few years ago with Tim Rutledge from Redline. More Cross tips are in this YouTube playlist and this post kicks off the 13 Cross season for us. HT Futility Closet and reader Paul Beard.